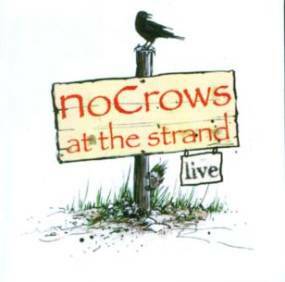 The Strand in question is a well-known bar in Strandhill, Co. Sligo, though this intriguing quartet began life at the equally renowned Shoot the Crows (hence in the county town). Live at the Strand is certainly an unusual album to review on these pages since by no means could it be described as an Irish traditional album and the foursome only partially draw upon Irish music as part of its vast swathe of influences. Indeed the term ‘world music’ might have been invented simply to describe the mélange of stimuli which galvanise No Crows, ranging from the Hot Club de Paris, to Portugal, Finland, Moldova, South America, Brittany, and the film work of Ennio Morricone. Indeed, there are only two Irish traditional tunes on the entire album, Continental Reel and The Mountain Reel (and both of these are given the idiosyncratic No Crows treatment), though a couple of others, Liz Carroll’s Reel Beatrice and Simon Jeffes’ Tune for a Found Harmonium, are pretty well known. The band itself comprises long-time Dervish associate Felip Carbonnel on guitar (often pulsating and exhibiting a multiplicity of chordal and picked effects), Anna Houston on cello and mandolin (the latter admirably plucked on Sweet Georgia Brown), the bedrock double bass of Eddie Lee and, finally, the band’s most famous member, fiddler Steve Wickham of The Waterboys. Some of the music here is exquisite in its intensity – a gorgeously evocative Finnish Waltz or Makh Tsu Di Eygelekh, a dolorous tune composed by a Jewish inmate of a German concentration camp – but this is also a band that knows how to swing as the Anna Houston-composed Rock the Gondola amply exhibits. However, the standout track is the closing Dimecres de Mati/Finn’s Waltz (both tunes written by Felip), a tremendous tour de force which encompasses intricate Spanish guitar work, resonant bass and swirling fiddle and cello. If No Crows lived in London, they’d be famous by now. Help put them on the musical map by purchasing this splendid album. For more details about the band visit www.nocrows.net.